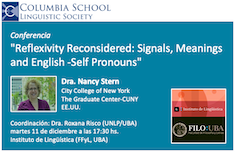 Conferencia "Reflexivity Reconsidered: Signals, Meanings and English -Self Pronouns"
El Instituto de Lingüística de la Universidad de Buenos Aires invita a la Conferencia "Reflexivity Reconsidered: Signals, Meanings and English -Self Pronouns", que tendrá lugar el martes 11 de diciembre a las 17:30 hs. La expositora será la Dra. Nancy Stern (City College of New York y The Graduate Center-CUNY, EE.UU) y la coordinación estará a cargo de la Dra. Roxana Risco (UNLP/UBA). Like Spanish Se, English -self forms are generally described as reflexive pronouns. However, Se and -self are used quite differently from each other, and in neither case does this traditional label explain their distribution. In this talk, I will focus on English -self pronouns, and will show that the notion of reflexivity does not describe most uses of these forms, and I will propose an alternative semantic analysis to account for their overall distribution. This study unites sentence-based and discourse-based approaches to grammatical analysis and provides support for a view of grammar as a set of signals and meanings that are deployed by speakers for purposes of communication.